What does the Crozet Community Advisory Committee do? The Crozet Community Advisory Committee (CCAC) is a 15-member advisory committee appointed by the Board of Supervisors that provides assistance to County staff and the Board on civic and community issues related to implementation of the Crozet Master Plan. The membership is broad-based to incorporate a variety of perspectives and ideas and to provide citizens, business persons and representatives of active community groups a chance to be engaged and heard in a constructive and meaningful way. When and where does the CCAC meet? Who can attend a CCAC meeting? The public is welcome and encouraged to attend any CCAC meeting. Meeting agendas will be posted on the CCAC webpage and at the Crozet Post Office CCAC Display case before meetings. Wednesday, May 20, 2015 from 7:00 p.m. to 9:00 p.m.
Public Meeting about Mechum’s Trestle site (located at intersection of Route 240, Route 680 and Route 250) – William McKechnie , Mechum’s Trestle LLC. Board of Supervisor (BOS) public hearing on leases for Old Train Depot and space under the Crozet Library – June 3 at 6pm at the County Office Building, Lane Auditorium, 401 McIntire Road. Review the details on CCA website by clicking here. Crozet Project Updates from Trevor Henry, Albemarle County Director of Facilities Development. (Update to be posted on CCA website after meeting). Tenants for old train depot/former Crozet Library and the other first floor space in the new Crozet Library. Click here for details. Recap of fifth annual Crozet Fundraising Swing Dance on March 14. Nominations of up to two local heroes to receive the annual CCA Good Neighbor Award? Funding pizza for Barnes Lumber town hall meetings? Next planning meeting for this year’s Crozet Independence Day Celebration (CIDC) is Tuesday, May 19 at 7:30 PM at the Crozet Firehouse. All are welcome to attend. Crozet Community Advisory Council meeting is Wednesday, May 20 at 7:00 PM at the Crozet Library. CTC’s next monthly meeting is Thursday, May 28, at 6:30 PM at La Joya in Old Trail. Crozet Car Show, May 30, 9:00 AM to 12:30 PM, Old Trail Village. 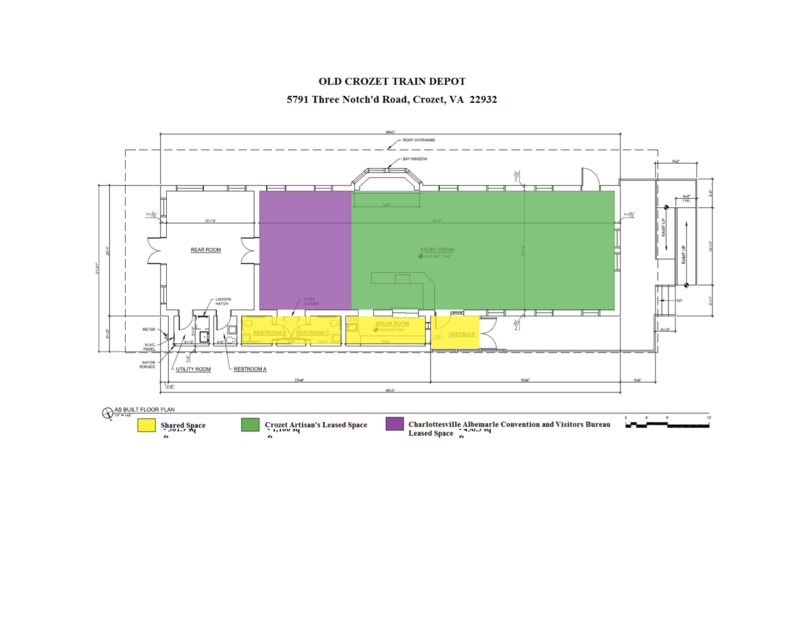 The Board of Supervisors will hear a county staff report and recommendation at their May 6, 2015 meeting (1:00 PM) regarding the tenants for the old Crozet train depot and the other side of the first floor space in the new Crozet Library. The county staff report can be viewed and downloaded by clicking here. It's also on the county's website at: http://albemarle.org/upload/images/Forms_Center/Departments/Board_of_Supervisors/Forms/Agenda/2015Files/0506/09.0_CrozetAreaLeaseES.pdf (Now you know why it's on the CCA website as well. The other side of the first floor of the Crozet Library (across from Crozet Running) is proposed to lease to Staengl Engineering LLC. The proposed lease terms are available by clicking here. The old train depot will be split between Crozet Artisans, LLC and the Charlottesville Albemarle Convention and Visitors Bureau. The proposed leases (both in one document) are available by clicking here. Here's a drawing of the proposed sharing of space in the old train depot. The Board of Supervisors meeting is Wednesday, May 6, 2015 at 1:00 PM. If you want to express your opinion about the proposed users of this spaces, you can email the Board of Supervisors at: BOS@albemarle.org or you can attend the meeting. There is NOT a public hearing on this topic, so y ou can speak at the beginning of the meeting (this meeting's agenda page) during the From the Public: Matters Not Listed for Public Hearing on the Agenda that occurs near the beginning of the meeting.